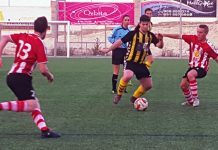 Home Football CD Montesinos Struggling Monte Fail to Finish. 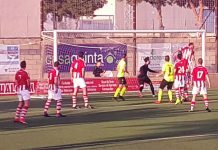 On yet another “must win” day for Montesinos, it was profligacy in front of goal as much as sleepy defending that meant they came away with nothing from this relatively early starting game. Still missing striker Vaz up top and busy midfielder Alex, it was a largely unchanged side who thrashed Betis last week. German, surprisingly, joining a four man bench. The day itself was more like the UK in March, i.e. very wet and windy, than the usual sunshine blessings we are accustomed to on the Costa Blanca and it was Monte who started the brightest. Following a penetrating move down the left by Carlos Morante, a snap shot from Maccan hit the bar and go over. Looking good so far then, might have been in the thoughts of the Full Monte followers. Minutes later all that optimism dissipated when a Santa Pola attack on the right saw a fierce drive brilliantly parried by Carlos, a second shot saved and then after a dismal failure to clear, a stubbed shot ballooned over him into the net. Barely, six minutes gone and Monte were one down. 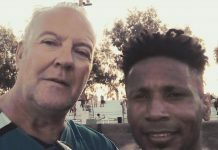 Despite this early setback, Monte stuck to their game plan and showed some promise with Jesus David and Carlos Lorente linking well, but the lack of an obvious “target man” meant that a lot of neat approach play simply went nowhere. Keeper Carlos was kept busy at the other either acting as a sweeper picking up long, hopeful balls or making smart saves when a Santa Pola raid resulted in a shot on target. 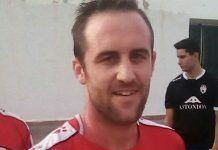 On 35 minutes however, after sharp interplay between Carlos Lorente and Maccan, Jesus David was on hand in the box to smash the equaliser into the roof of the net. Some reward for his enterprising play along the flanks. Monte were back in the hunt. On the stroke of half time things could have been even better though when Monte had one of what would be several chances to open up a lead, when Maccan, in the clear at the edge of the box and the goal gaping, managed to hit his shot onto the bar and over, when it seemed easier to score. A miss that was to prove costly in the final reckoning. 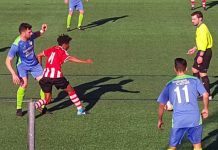 The second period saw Santa Pola very much in the ascendancy, with Monte struggling both with the dreadful conditions and the relentless home attacks down both flanks. 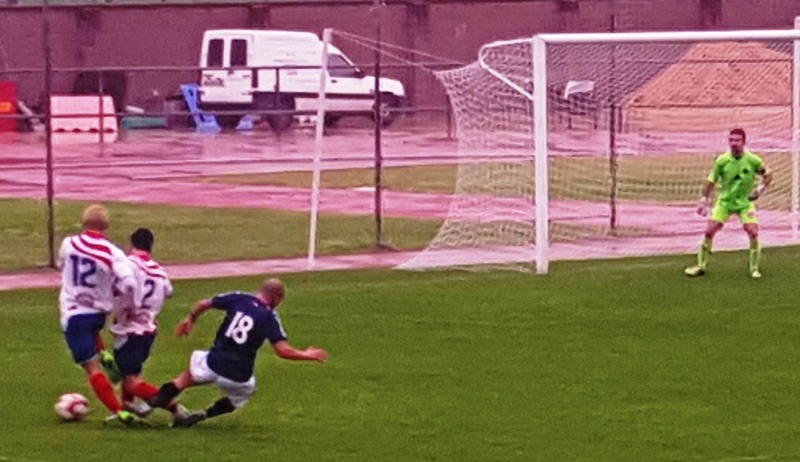 It was only by some stoic defending and good luck that they managed to maintain a slim foothold in the match. But, you could sense another Santa Pola goal was on the cards with almost every foray forward. A slew of now customary substitutions on the hour mark saw David replaced by German on 65, Jesus David swapped with Dario (presumably with injury as he had been one of Monte’s best players up to that point) on 67, the fading David exchanged for Manuel on 71 and finally, Josema for a limping and forlorn Maccan on 77. During this time, Santa Pola made several changes as well. After the obvious disruptions caused by these multiple substitutions, the game settled into a very much end to end one, with both teams living dangerously, pushing for the winner. It has to said, that the better of these opportunities to score fell to Monte, but time after time, the shot was wayward or straight at the keeper or wildly wide. On another day these might have gone in, but this was not another day. 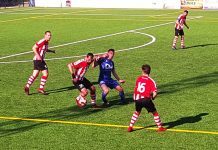 These chances both came and went and, with a monotonous inevitability, Monte’s luck finally ran out when following yet another moment of indecision and failure to clear a loose ball in the box, resulted in the Santa Pola player poking it home. For all Monte’s huff and puff and occasional industry they didn’t take the chances that fell their way and ultimately, paid the price. 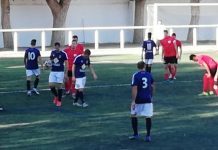 In extra time, Santa Pola lost a defender to a second yellow, but its impact was negligible, as the Monte team had the look of a side who knew, despite their efforts, the game was up against a decent but very beatable Santa Pola side. 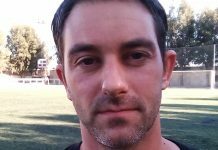 With the “home” derby against cross valley rivals and former league leaders Racing San Miguel looming, Monte have almost no time to lick their wounds before continuing the search for the elusive points to remain in the division. On this showing, that may have to come from the failure of others. Just a quick word, regarding the referee, who, on the whole, was excellent. A refreshing change to see the man in the middle actually control the game and, impressively, be aware of (and use!) the “advantage” law of the game (Part of Law 5 if anyone is interested). Well done Sir, can you come again next week? 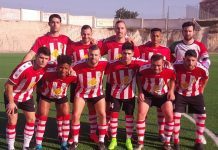 TEAM:-Carlos, Dimitry, Fernando, Morante, Adrian, Carlos Lorente, David, Diego, Maccan, Daniel, Jesus. SUB’s:- Manuel, Diario, German, Jose. 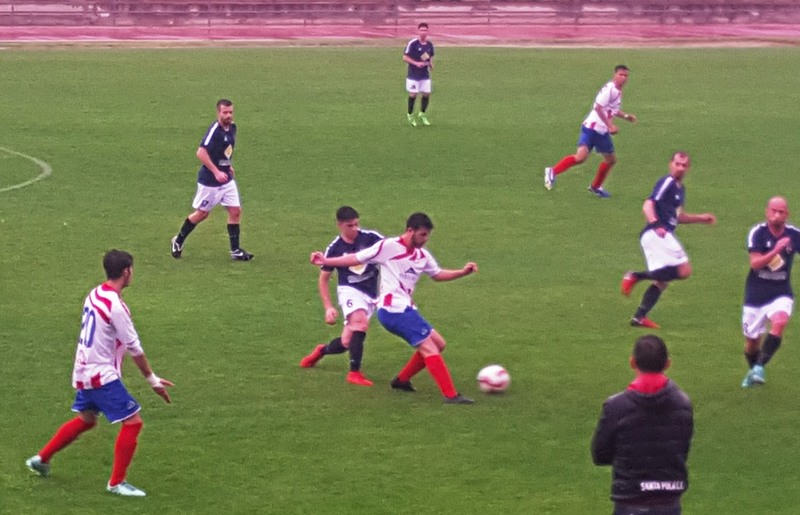 CD Montesinos will play a “home” game against Racing San Miguel, at 5.00pm on Sunday 7th April 2019. 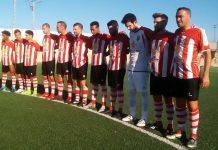 The “home” game will be played at Polideportivo Municipal ” Juan Carlos 1″, in ALGORFA. The game will be sponsored by The 3 Amigos. 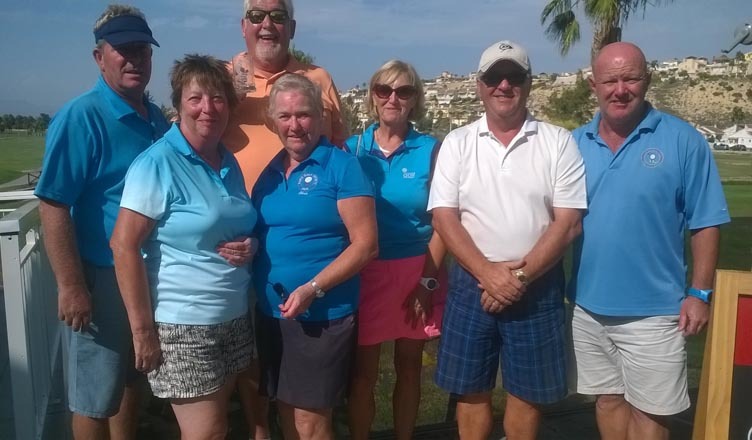 Travelling supporters to meet at Bar Tambalache, Los Montesinos at 4.00pm.